Sunsky (Jaheo Jung) made a small city car for the 12th BrickInside Creation Contest. City Hunter his its nickname. He has used several Technic soft axles of different lengths, to give the car some smooth surface curves and quite a distinctive look. However I'd say the aesthetics part is not the unique or even the most distinctive feature from this roadster. Despite its size, City Hunter still has some nice working features, like opening doors, one working two cylinder motor and the front wheels also steer of course. It was exactly the steering function in a car this size, that required some innovation. See the images below and look how Sunsky managed to make the wheels steer, without using any specific Technic steering parts. Notice the center gear was raised by half stud, to fit with the surrounding gears. Also a special note for the very small seats, which still present however some adjustments, as you you can notice from the images below. The steering wheel is also adjustable, despite only seen from the video. For additional images, you can look at Sunsky Brickshelf folder, or even more from the original City Hunter presentation page at BrickInside (although in Korean). The steering mechanism is brilliant indeed! The steering is a neat idea, but doesn't it change the center pivot point from being where it is supposed to be? In this way the wheel itself doesn't move forward or backward while steering. So it doesn't exactly steer then? The front wheels can just be positioned? In the video, you can see how the pivot point moves while steering. Because the pivot point itself is not fixed, the wheel moves only a little in forward/backward direction while steering. Main idea is "let's try to make the center of the wheel as stationary as possible"
But actually, this mechanism has some flaws, too. For example, the maximum steered angle is somewhat limited. In my case of City Hunter, it's less than 30 degrees. I think it's not enough. I tested a prototype for geometrically ideal reproduction of virtual(not physical) pivot point in 2005. 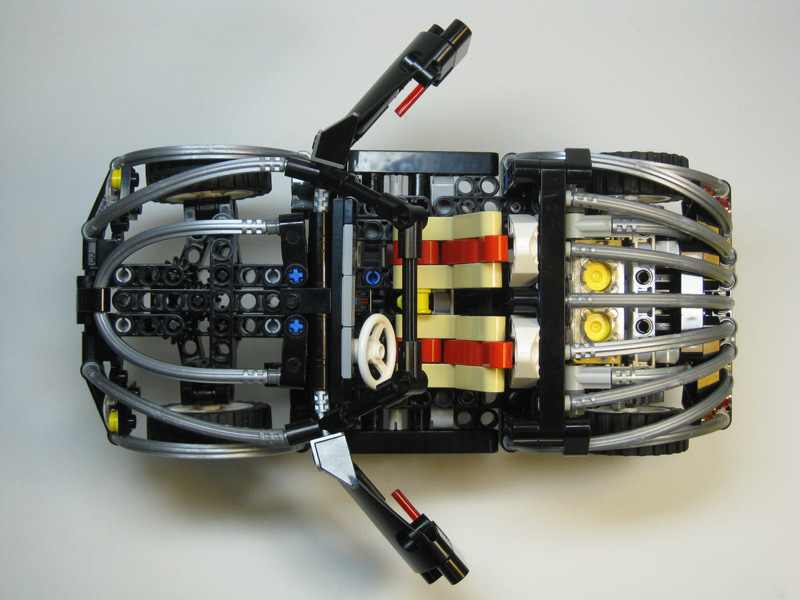 In the photos of the link page, the black beam represents fixed chassis and the colored parts move in parallelogram. The white dot gives a virtual pivot point. This can make the wheel steered at a pivot point where a real(physical) axis(such as axle or pin) could not positioned, geometrically minimizing the required wheel space. Yes. That's good. But, I could not yet make the mechanism small enough to be useful.